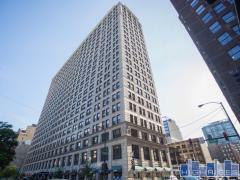 340 on the Park features one of the best locations in Chicago. Enjoy unobstructed views south to Millennium and Grant Parks, the harbor and lake. North views from the building are of city, river and lake. Take in all these great views from high above the city on your private terrace. Luxury features at 340 on the Park include Quartz Counters, Snaidero cabinets, GE Monogram stainless appliances, bamboo floors, luxury baths with spa tubs, Toto, Dornbracht and Duravit fixtures too. Building amenities include 24 hour doorman, fitness center, indoor lap pool, hot tub, club room and winter garden with terrace. Have any comments or questions about 340 on the Park? Ask your question and/or share your thoughts about this Building. I'M INTERESTRD IN THE SOUTHWEST CORNER OF THE BUILDING. A LOW FLOOR. IS THERE A OUTDOOR SUN DECK? All the amenities are on the 25th floor and there is an outdoor terrace.